3) remove its power plug and the SCSI cable. We can see that the aeration's holes are partially obstructed. 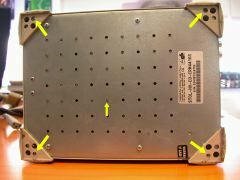 Top yellow arrows show the screws to be removed, the one under another obstructing agglomerate of dust. We upturn the burner: 4 screws again (big yellow arrows). In this model, all the screws are the same. The yellow small arrow, again, points to an agglomerate of dust. Next the 4 screws which clamped the burner onto its craddle. Here only the two first ones on one side. The same screws on the other side. ... Sorry for this bad picture ;-). 2) SCSI identifiers (caution: in my burner two separated, but superimposed, rows of cables). 3) cable which connect the burner to the terminating switch. 5) (not an the picture) the power cable. ... now outside the machine! Eject the tray (left yellow arrow) with the help of the well known macintosh first emergency tool: the trombone! (right yellow arrow). 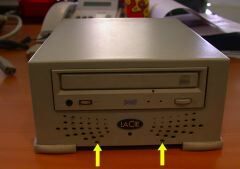 Push on the plastic lug (yellow arrow) to unlock the cache. 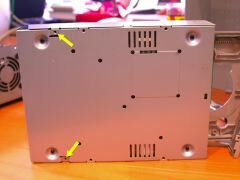 Remove the two cruciform screws (near the backside) to extract the cover. Two more lugs to unhook the beast ;-). Yellow arrow: the lens to be gently cleaned ! 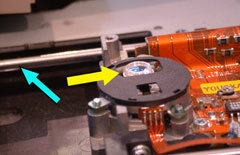 Some will say that the use of a cleaning CD is enough to remove dust on this kind of lens. However, I discover that for burners, this is not often the right tool... more even if the burner is located in a smoking area! -> so: cotton bud with isopropylic alcohol ;-). The blue arrow points to the axis on which slides the head. You can clean this axis with a soft tissue impregnated of sewing machine oil. This is an important operation, especially if you face problems when burning big sized cds and not when burning cds with a small quantity of data. The tools... but isopropylic alchohol, cotton buds and soft tissue not shown ;-). As usual, follow the instruction above in a reverse order to rebuild the burner.